It's About Value: What Did You Bring Me, Daddy? What Did You Bring Me, Daddy? A few weeks ago, Joshua Duncan, Scott Selhorst and I talked on the Start With the Customer prodcast about getting value from trade shows. We discussed goals, capturing value from shows and choosing the right ones in the first place. You can't plan an event, trade show or conference without asking, "What are we going to give away?" My sons are now well-trained to expect a toy or a pen or a thingamy every time I go to a conference or trade show. I always manage to come home with several doohickeys for them and for myself. Some I've been using for years like the Leatherman Wave multitool I got from HP at a channel conference. Most others, sadly, get tossed after a few days - just like datasheets. The most interesting item I've seen recently came from the sharp folks at Ksplice when I was at Red Hat Summit in May. More on that in a moment. There are two reasons to give something away at an event: drive traffic to the booth with the intention of engaging prospects or build awareness over time through sustained impressions. If you want to drive traffic, have a giveaway that is unique or truly novel - something that makes people stop you and say, "That's cool. Where do I get one?" To get sustained impressions, make sure you choose something that is of real quality so it will stand the tests of time - just like your products. Keep the quantities down, too. You don't need to break the bank and not every booth attendee deserves to get one. With grocery stores paying 5 cents each time you bring your own bag, sturdy canvas totes, while a touch mundane, give lasting utility, reduce plastic waste and return a small financial reward. I keep my Leatherman on my dresser and use it at least once a week for some quick repair around the house. There's a nifty book light in my backpack I use to read on planes. Ksplice, went for booth traffic and engagement by going cool retro and gave out diskettes with their web site and tag line on the label. When was the last time you saw a 5 1/4" diskette, let alone used one? Seeing one on their counter drew me to the booth like a moth to a flame. I had a good conversation with them, took one and continued my tour of the booths. About 10 minutes later, someone saw it in my hand and stopped me with, "A floppy disk? What are you doing with that?" We reminisced a few moments and I told him where he could get one of his own. Mission accomplished. And since Ksplice bought them on eBay for about $0.20 each (they were previously used), mission accomplished inexpensively. Quality and truly useful items WILL get used repeatedly. 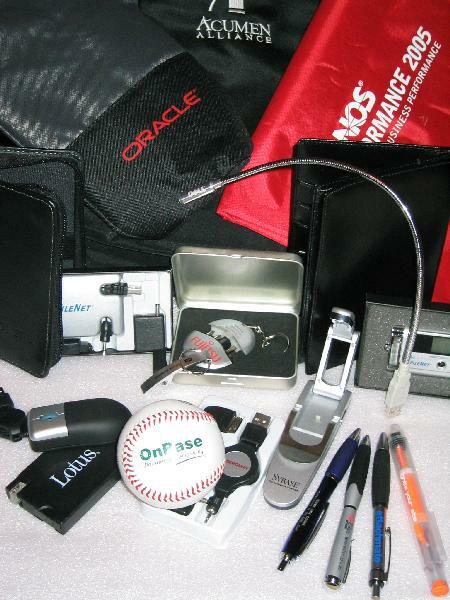 Cheap giveaways (pens, pins, toys) cheapen your brand and don't differentiate. Avoid them. It's okay not to give something to everyone who shows up. Spend a little more per item and give away fewer to get more perceived value. Novel items related to your industry or product line will get you traffic. If your offering and messaging are on target, why bother giving anything away in the first place? What are some of your favorite or most memorable (good or bad) things you've brought home from a trade show?